Now that we’ve eaten all of the Thanksgiving leftovers, our attention quickly turns to the rest of the holiday season. 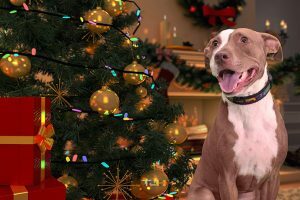 Whether your family is trimming a tree or lighting a Menorah, there are lots of potential hazards to your pet to keep in mind when you prepare your home for the holidays. Hanukkah begins on December 2 this year, so we’ll start here. There are lots of delicious, traditional foods that can land your pet in the vet’s office faster than you can say Crag Sameach. Traditional Latkes are dangerous for your pets. Onions are one of the key ingredients, and onions are toxic to your pet- both dogs and cats. They can cause hemolytic anemia, which affects your pet’s red blood cells. Although one latke may not be enough to cause hemolytic anemia, they’re cooked in oil and loaded with carbohydrates, which can lead to gastric distress. Needless to say, keep your pets away from the latkes, and make sure the kids know not to feed the household pets. Sufganiyot doughnuts/pastries are another big no-no. Although they likely don’t contain ingredients considered to be toxic, they are high in fat and calories. Even just one of these tasty treats could cause gastrointestinal problems including diarrhea, vomiting or even pancreatitis. Chocolate Coins are a big threat to your pet- as are any chocolate treats. Chocolate contains both theobromine and caffeine, which can cause problems for your pet, not to mention the foil wrappers which can wreak havoc with a pet’s intestinal tract. Ensure that all chocolate treats are kept in a safe location away from curious pooches. The Dreidel is a fun childhood toy. Your dog might think it’s a toy for them, too. A spinning toy on the floor may be irresistible for an excited pup. Getting it back from your pet may require a costly surgery. Keep the eye on the dreidel and the dog to avoid disaster. Of course, the Menorah can not be kept off of this list. Open flames and excited pets are never a good mix. 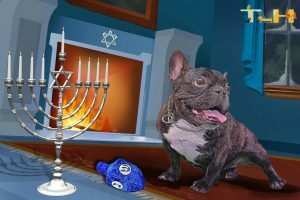 Make sure your dog or cat does not have access to a lit menorah with candles or open flames. Candles of any kind are a potential hazard- whether they are on a Menorah or not. Even if you have scented holiday candles, we recommend keeping them off of coffee tables or other low areas where wagging tails can knock them over, or get burned by hot, melted wax. Traditional Christmas decorations can also pose hazards to your pets. Certainly, we need to talk about the tree. Whether you have an artificial tree, or a live tree, there’s lots of do’s and don’ts to keep your pets safe. Tinsel is a great way to spruce up your tree, but we recommend avoiding it altogether. If you feel you must use it, place it high on the tree, out of reach of your pet, and pick up any loose pieces immediately. Tinsel can get stuck in their intestinal tract- and enough of it will require surgery to get it out. Some pets consider many ornaments to be toys, and are meant to be played with. Try to keep the fun looking ones out of reach of your pet. Almost any type of ornament can cause intestinal blockage, meaning it won’t come out either end naturally in most cases. It’s been a long time since I’ve put popcorn strings on a tree- mainly because I know that my dogs would like nothing more to get a free snack when I’m not looking. We suggest to stay away from anything edible on the tree. If you opt for a live tree, your pet may consider the water in the base to be a new water dish. Discourage your pet from drinking from the base of the tree, as the oils from the tree can upset their stomach and irritate their mouths. Although not likely to be life threatening, your pet will not enjoy the consequences. Neither will you. Needles from both pine and fir trees should also be swept up routinely. Lots of dogs can’t resist their scent, and can consume them when you’re not diligent. Again, not life-threatening, but if they consume enough they can become sick. Ensure that your tree has a solid base and can endure the occasional nudge (or worse) from a larger pet, or climbing from a curious cat. Poinsettas, Holly and Mistletoe are all toxic to your pets, but the biggest threat in the plant world still comes from the Lily. Although most lilies are found in arrangements in the spring or around the Easter holiday, lilies can still be found in many arrangements. Lilies can be deadly for your cat, so if you have lilies- keep the cats away. 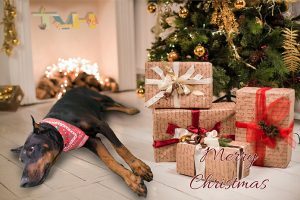 I’ve outlined a long list of other common holiday foods that pose a risk to your pets in my other holiday safety blog- which you can find here– along with lots of other holiday tips. On behalf of the entire team, we wish you a happy and safe holiday season filled with joy and cheer.